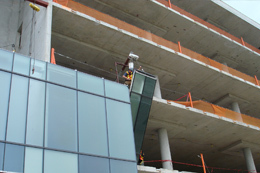 On Staff Glass Installers | Window Installation | Stouffville Glass Inc.
We employ our own installation staff. Only then can we ensure quality and consistency from project to project. Stouffville Glass is extremely efficient in managing its subcontract installation teams and this is how we have operated for many years. We feel if we can manage milestones and quality and not manage individual employee productivity the end result is much better. Our project manager photographs the installation progress for his own record or if a consultant is requesting additional information for compliance of detail. Sub trade meetings and general contractor meetings will be attended by the head installer or the project manager which will be there to update the construction team of the progress on site. We have our own fleet equipment for our projects with minimal rental requirements. Currently our fleet consists of telescopic forklifts, telescopic boom lifts, scissor lifts and a spider crane for those heavy and awkward lifts. All our site workers are trained and certified for the equipment they are using and Ministry of Labour training for construction sites.